Geetha Ganesan and a Flute Artiste have jointly established UTTARAA CENTER FOR PERFORMING ARTS (a unique Institution, exclusively training students in Bharatanatyam & Flute) in the year 1999. Ever since, there is an exponential growth for the institution and the institution has successfully conducted its 9th Annual Celebrations during August 2008 in Hyderabad. To know what The Hindu says about these two artistes please click here. The institution has produced several highly talented young dancers and musicians in a short span of time whose achievements speaks volumes about the institution. These achievements include CCRT Scholarship in Bharatnanyam and Flute, prizes in music and dance competition, awards from various organizations, solo performances, Arangetrams etc. In fact, the institution has been termed as Kalakshetara of Hyderabad by none other than the renowned musician Shri Nookala Chinna Sathyanarayana. The rare combination of music and dance at the institution has lead to the choreography of a highly innovative item called “Wind and Earth” – Flute Vs Dance, a unique Jugal Bandi in which a group of dancers perform in a graceful rhythmic pattern in tandem with the synchronized musical phrases played by a group of flutists. 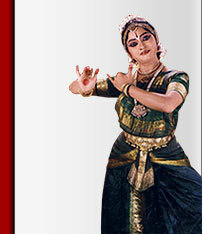 The institution under Geetha's guidance today, trains students only in Bharatanatyam. Some of the students from this institute who won laurels both at various places in India are Geetha Krishna, Rishika, Priyanka, Suvarchala, Sneha, Arpita, Amrutha, Shrikari, Sushmitha, Amulya and Aditi. To date, the institution has completed ten arangetrams of its students within a span of 12 years of operation.